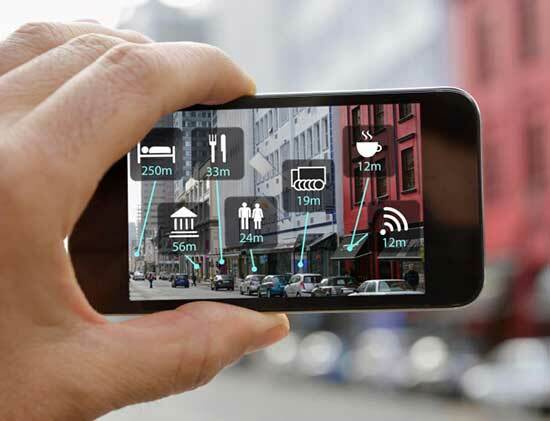 One of the most interesting new arenas for inventive visual design, one that has enormous potential, is the field of augmented reality (AR). Augmented reality presents a real time direct view of the physical world around us seamlessly combined with computer generated imagery. Simple versions of AR have been creeping into our visual media for years. A common example we see here in the United States is the artificial first down line that appears when we’re watching American football on television. With technology’s advance AR has moved from the realm of professional special effects into the every day world. Our current consumer electronics now have the processing power to bring complex, interactive AR to everyone’s fingertips. And today the most common way to experience these hybrid blended visuals is by using an AR app on a smartphone or tablet. This past year Pokemon Go, an AR based game, was an international viral sensation. 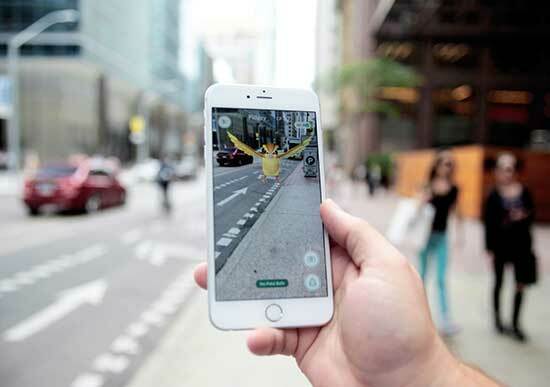 Players with the app installed on their phone or tablet could scan the streets and public spaces around them in search of Pokemon characters only they could see. 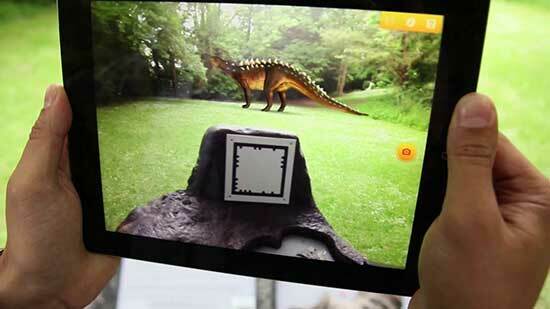 Other popular apps with a similar focus put dinosaurs or zombies in the viewer’s real world space. Tourists and travelers often need assistance when navigating the unfamiliar world around them. 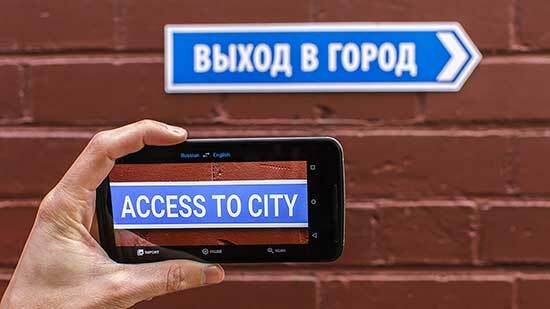 AR apps can help make that space much more accessible by guiding users through an unfamiliar airport, directing them to shops and cafes, and by translating street signs. Smartify is an AR app that transforms a smartphone into an art museum docent. With this app viewers get a sophisticated tour of the collections in some of the most prestigious museums around the world. Here’s a brief video showing what that looks like. 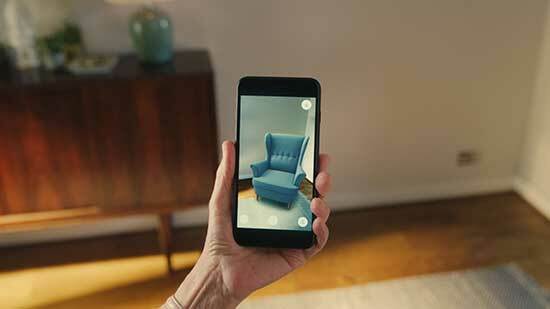 The Swedish furniture store IKEA has an AR app that allows customers who are browsing the company’s website to see what select pieces of furniture will look like in their home before they make the purchase. As you can see there is a nearly limitless range of possibilities for this emerging technology. School textbooks, user manuals, retail fashion sales, architectural and urban planning, medical training… The list just goes on and on. It’s an exciting new arena for designers. And because so much of the action takes place on smartphones and tablets, both Apple and Google have taken the initiative in creating AR developer kits specific to their operating systems. They have also published best practice guidelines that encourage developers to create the most effective apps possible. You can see their introductions to AR here and here. On a final note, the following is a short video prepared by Dent Reality, a London based AR developer. 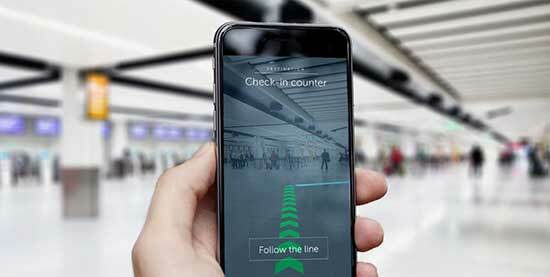 It shows how AR could become a regular feature to help with your everyday routines such as grocery shopping. 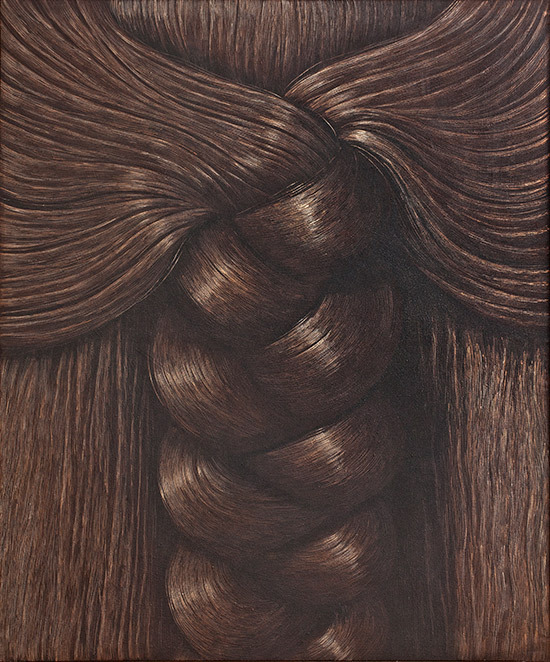 I recently rediscovered the work of the late Domenico Gnoli and I fell in love, all over again, with his wonderful paintings. Let me share some of my thoughts about his work. The first thing that comes to mind when viewing Gnoli’s paintings is their intimacy. His viewpoint is a very tight close up – way past the borders of conventional personal space. It’s what you would see if you were a child being hugged in your parent’s arms, a lover embracing their sweetheart, a tailor examining the detail of a seam or button hole, or a hairdresser making final adjustments on a client’s new hairstyle. It’s not an alien point of view but it is a special one, something we don’t experience routinely. At the same time Gnoli’s compositions seem monumental. For all their intimacy they also look like massive forms approaching the scale of Mount Rushmore or the Lincoln Memorial in Washington D.C. It’s true that some of his paintings are large (six feet tall or more) but even those paintings seem like they are only hinting at the real size. Sometimes the looming shape of the main object nearly fills the rectangle of the canvas leaving just a sliver of empty space along an edge. At other times the object totally fills the rectangle and seems to extend way beyond its borders. In both instances it makes the scene appear huge, like a land form too large to accurately capture in a single painting. Gnoli’s compositions are very formal and calculated. Precise shapes – each with their own perfectly tuned color or texture – lock together like pieces in some sort of high-stakes jigsaw puzzle. Even a casual viewer can see that nothing in these paintings has been left to chance. Another thing that stands out when viewing one of Gnoli’s paintings – particularly when you see one life size – is his patient and painstaking attention to detail. His paintings are not as obsessive as the photo realist painters but because he chose such a small detail of a larger scene he needed to lavish attention on subtle nuances such as light falling on strands of hair or the translucent surface of pearl buttons. 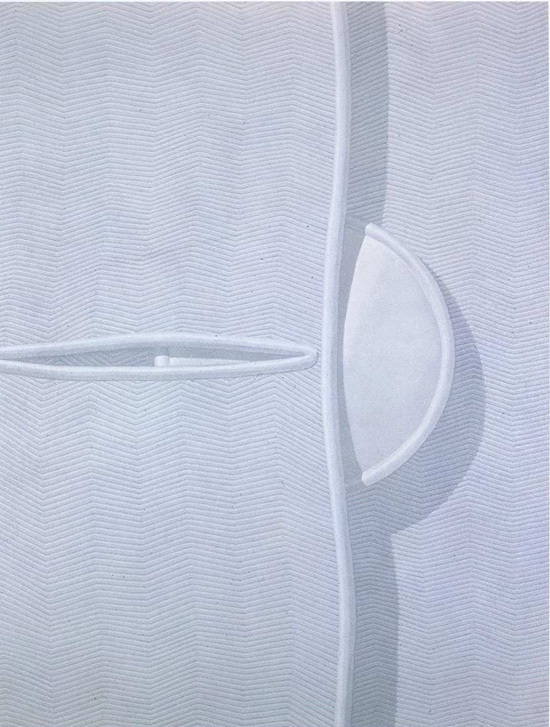 In some of his paintings the three-dimensional texture of a fabric’s weave mixes with the cloth’s printed pattern and both texture and pattern extend over the entire surface of the painting. 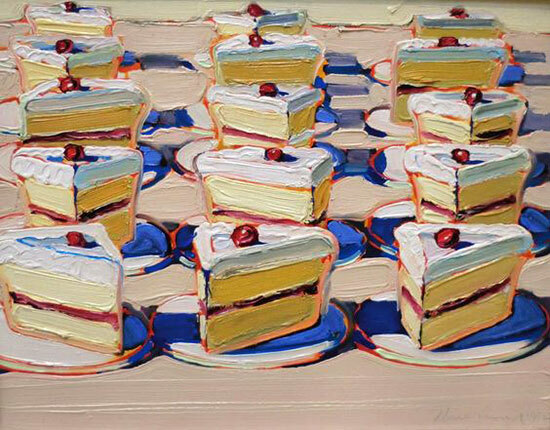 It’s an unrelenting attention to detail that gives his paintings tremendous authenticity. Apart from all these physical characteristics there is a pronounced but intangible “feeling” about Gnoli’s paintings. They seem eerie and magical in a way that is somewhat reminiscent of the surrealist painters Magritte and de Chirico. Yet, there is nothing overtly manipulative in Gnoli’s images. Time, space and objects are very normal here. There are no improbable juxtapositions. It is obviously just the unusual close up point of view and the carefully arranged compositions that create this psychological edge to the scenes. Domenico Gnoli was born in Italy in1933. His father was an art historian and his mother was a ceramics artist. He was trained as a theater set designer but soon became an illustrator and then a painter. Gnoli moved to the United States in the 1950s where he worked for Sports Illustrated, Fortune, and other magazines. 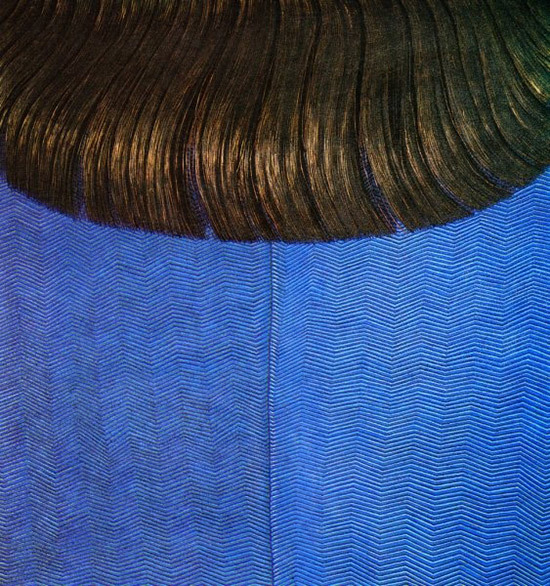 In 1969 he had his first major exhibition at the prestigious Sidney Janis Gallery in New York City. The next year, at age 36, he died from cancer. In his brief career Gnoli produced a modest number of paintings but his vision was so focused – and each painting reinforced that vision so strongly – that he left the art world a sublime and easily recognizable legacy. Several weeks ago I wrote about the Japanese art of Kintsugi, the process of repairing damaged ceramics with seams of gold. The idea of a repair transforming an object into something of even greater value has stayed with me. 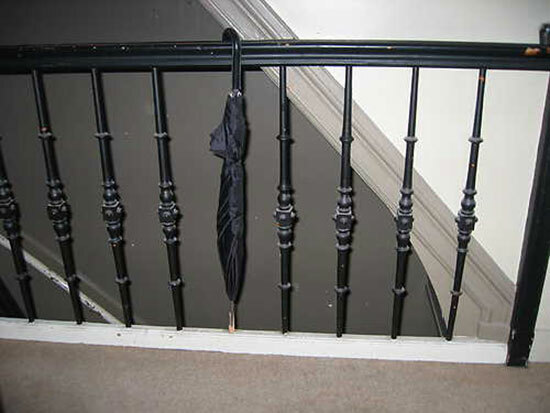 “…On its white grillwork shelves stood a number of unusual, very old objects. The only thing they seemed to have in common was that every one of them had something wrong with it. So, is this what artists do, make something that is perfectly itself? 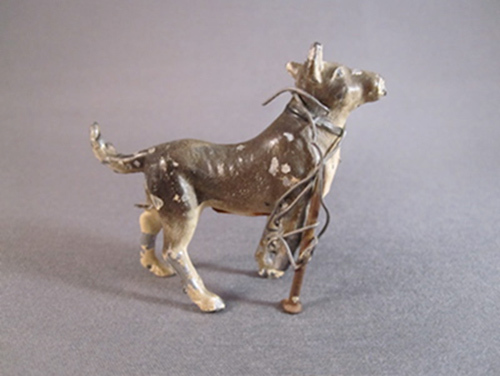 Gill seems to have been influenced by Marilynn Gelfman Karp, author of “In Flagrante Collecto (Caught in the Act of Collecting),” who coined the phrase poignant repairs and who has a large collection of these humble objects. 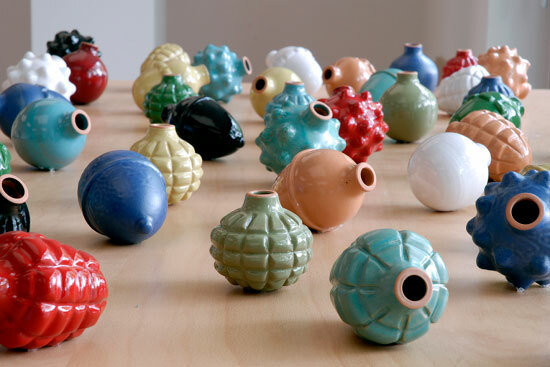 Another influence is Andrew Baseman who collects and then profiles these objects on his website. So let’s look at a few of these poignant repairs. What can they tell us about the act of creation and transformation? These broken ceramic pieces were repaired with metal staples. According to legend it’s just such a repair that caused Japanese craftsmen to develop the art of Kintsugi as an aesthetically pleasing alternative. Photos courtesy of Andrew Baseman. Talk about wacky. A broken ceramic lid has been used to make a pin cushion, with hand embroidered red feathers. Photos courtesy of Andrew Baseman. This little dog makes me cry. Some one loved it enough to fashion a new leg from a nail and wire. Photo courtesy of Andrew Baseman. 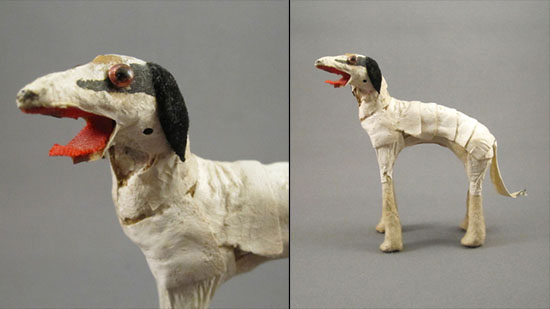 This dog lost its fur and so an inventive owner used cotton tape to make a new coat. Photos courtesy of Andrew Baseman. If the above repairs were made out of practicality combined with love then the following ones add in a more conscious attempt at a design solution to a problem. The online site Platform 21 organized a contest, Remarkable Repairs, for the best repair. Many solutions are funny and some play on visual puns. 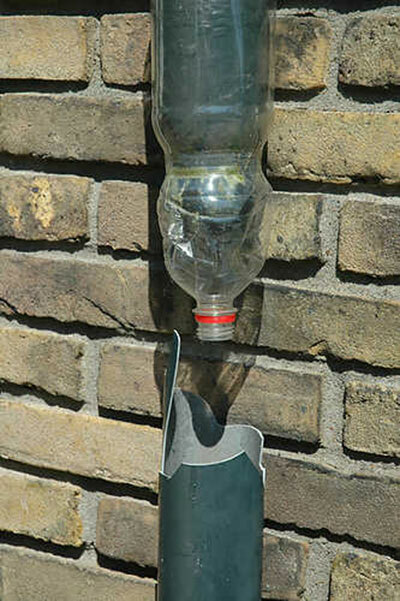 Repaired drainpipe by Jaap van der Feer. 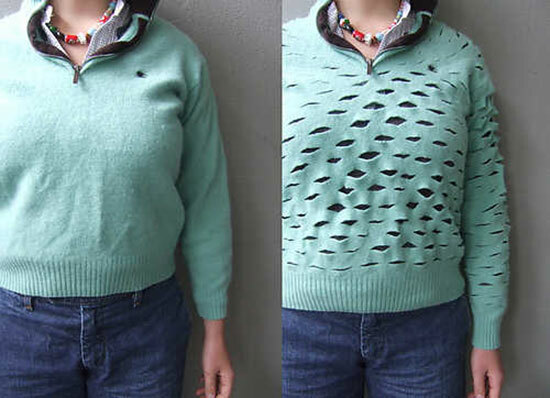 This piece started out as a sweater that had shrunk and no longer fit. Calypso Schuijt expanded the sweater with a series of small cuts, creating a perfect fit. Gerald Tros had a microwave with a non-responsive keypad. 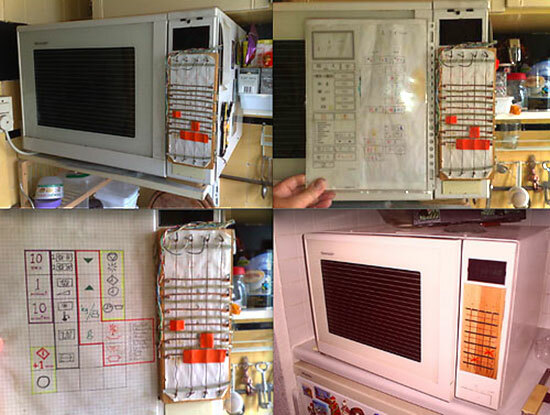 With some minor rewiring and a custom designed wooden keypad he now has a one-of-a-kind microwave (and he later made a very “arty” one for a friend). All of the pieces I’ve shown so far have one thing in common, they’ve retained their functional use, and that has been the main impetus behind their creation. 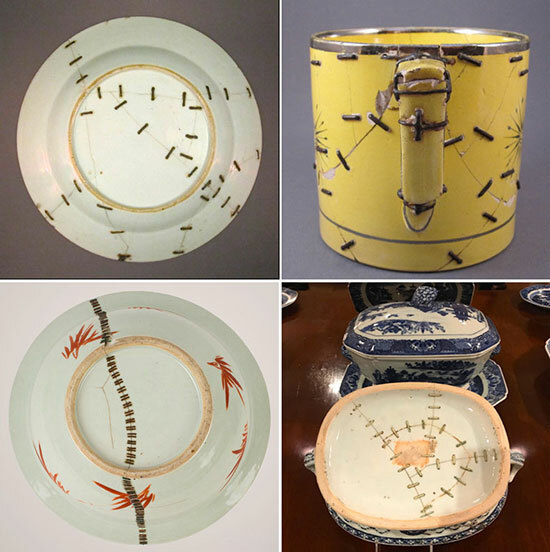 The following works are by artists/designers whose work straddles the line between “poignant repairs” and the larger tradition of artists working with repurposed materials. Looks like there will be no new post this week. My computer is staging a protest and for the fourth time is on its way to my local Apple store. Last time I broke down and bought a new and very expensive logic board. I thought I had solved the problem but it looks like my computer hates me as much as I hate it. I do promise a new post next week, regardless if my computer is back home. We often hear the phrase “design is all around us.” That usually refers to items such as artworks in galleries, the clothes we wear, the books and magazines we read, or the furniture in our houses. Design, however, also happens on a more intimate, even microscopic level. And at a much larger more global and conceptual scale. In today’s blogpost let’s look at three examples of artworks inspired by large, global and conceptual views of design. Artwork that, at the same time, suggests parallels at a more intimate level. The first example is a painting by Sarah Trigg from her series titled Metastatic Explorer. 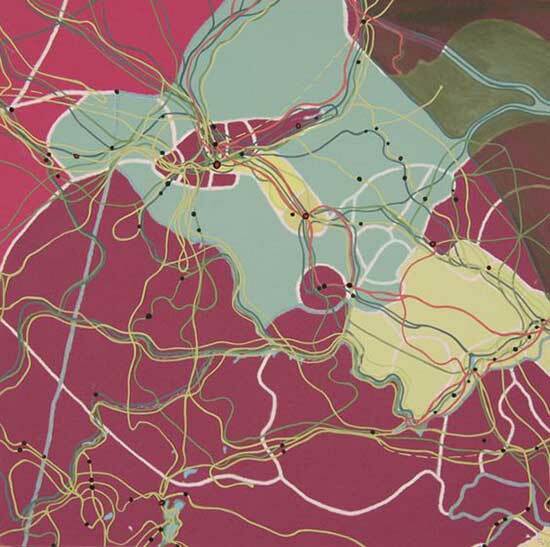 The painting is based on overlaid maps of natural geography and man-made systems/responses. Here she starts with a map of Native American tribal territories and the organic pathways those people developed for moving through that space. On top of this she has layered the paths developed by European explorers who moved into the same territory. The next example is a painting by Shanghai artist Xinjian Lu from his City DNA Project. The paintings in this series are based on satellite photos found on Google Earth. The image below is a view of London. Rather than being mere copies of the photos, these artworks are heavily stylized and subjectively colored interpretations. 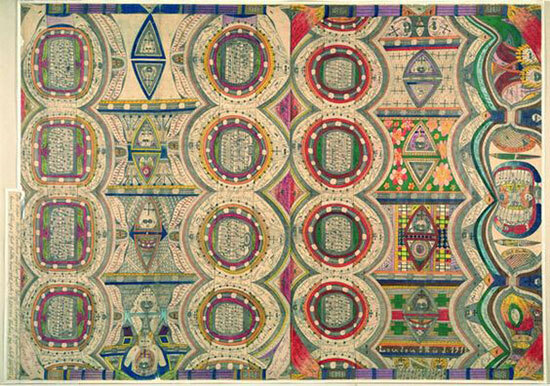 Each finished painting suggests the patterns and rhythms of a particular city – its spiritual DNA. 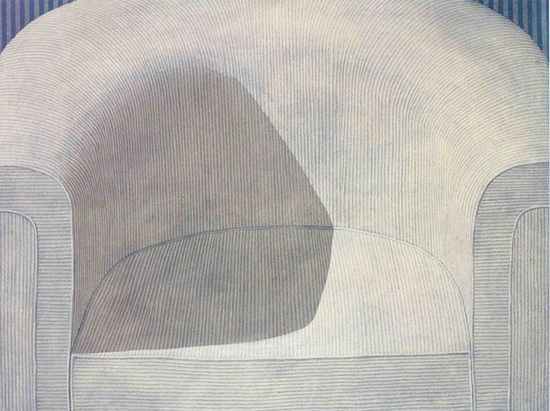 The paintings by Xinjian Lu are both representational and abstract. Viewers who are familiar with a city being depicted here might recognize some landmark or a general pattern of streets. But like Piet Mondrian’s painting Broadway Boogie Woogie these paintings are more universal than specific. They describe the urbanization of modern China and the globalization of our entire contemporary world where every big city is now more or less generic. Our final example is the short video titled Arena currently trending on many web sites. The video was created by Irish painter Páraic McGloughlin. Once again this is a piece created from satellite photos found on Google Earth. This time, however, the images are presented just as they were found. The only changes being that they are cropped to emphasize their similarities. Highways, entire neighborhood street grids and enormous structures seem to move about the frame as though they are merely small elements in an arcade game. For those of you reading this in email click here to see the video. All three of these artists use resource materials – maps and satellite photos – that represent massive amounts of physical space. All three see parallels between their global perspective and the intimacy of the human body, from organs to cells to genetic material. They also recognize that the design of forms and systems is a consistent element that appears at every scale. In two recent posts I discussed the use of repetition and its relationship to the design principles of Balance, Unity and Variety, the Grid, Pattern, and Rhythm. Today I want you to put to use your new-found knowledge about repetition. 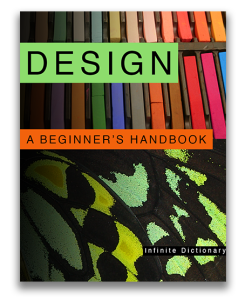 I suggest you begin by reviewing our book Design: A Beginner’s Handbook and rereading the posts, Repetition and the Principles of Design Part One, and Part Two. This is a collage assignment that can be completed with paper and board or digitally, using image processing software such as Photoshop. You may add additional materials such as paint, drawing media, ink, etc. Spend some time looking at images until you find one that grabs your attention. Select a single image and make multiple copies, I’d suggest a minimum of ten copies. You can use the entire image or cut out sections you do not want to include, for example, in a photograph of a person walking down the street you might want to remove everything but the figure. Next, decide which elements and principles of design you want to emphasize in your composition. Perhaps you want to work with Unity and Variety and the Grid. In this case you might decide to lay out your copies in a grid format and then create variations between the images by adding the elements of color and texture to each image. Another way to employ the principle of Unity and Variety would be to work with the gestalt principles discussed in our book. Consider using grouping or continuity in your composition. What are other possible options? 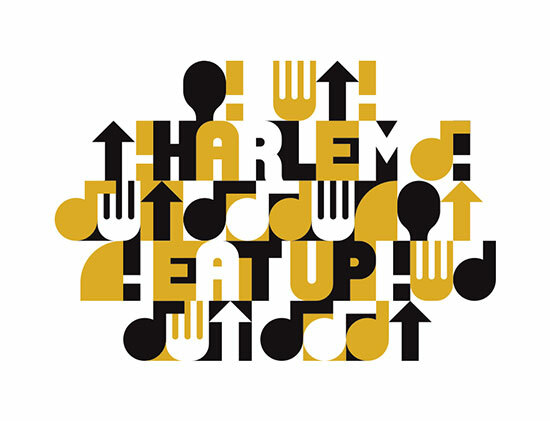 You can suggest movement and rhythm by playing with the spacing between the images. Working with a copy machine (xerox image) or image processing software you can change the size of your repeated image. If you overlap images, with smaller images behind larger ones, you can create illusions of space. Think about the possibilities of working with radial symmetry or pattern. You can alter the orientation of your images – vertical, horizontal, diagonal. 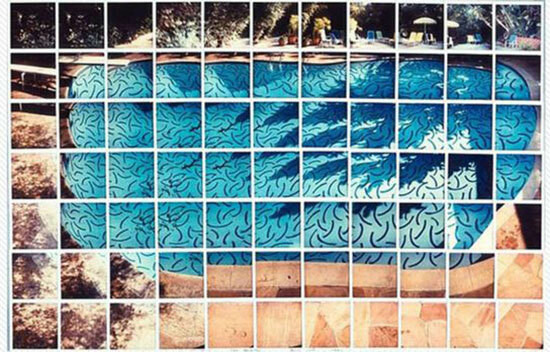 You can even break up the repeating image into smaller units that are then combined into a single repeating motif. Please pay attention to the positive and negative shapes in your final composition. They are essential to the success of your project. In addition, craft is equally important. Make clean cuts and if you mount your project onto board avoid ripples and glue marks. This exercise is very simple but if you push its limits, incorporating multiple design elements and principles, you will arrive at a complex solution. Share your solutions by posting to our Facebook page. Whenever I find myself looking at a collection of images – in galleries or while surfing the web – I’m inevitably drawn to objects that are both severely understated and yet inventive. I think I’m fascinated by how the artists who produce work like this can still create visual magic even after most of the supportive props are removed. When I look at these images I see obvious materials, simple marks or colors and straightforward compositions. But I also see a love for the elements and principles of design as well as a celebration of the creative process in its most fundamental state. 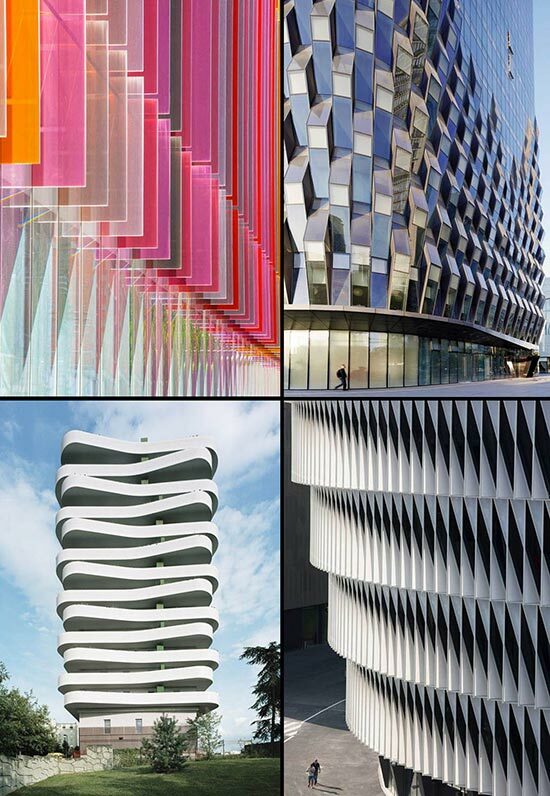 The first image is by the noted French designer Pierre Charpin. 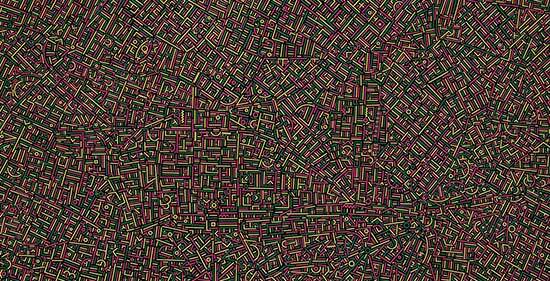 It is felt tip marker on a 28” X 39” (70cm X 100cm) piece of paper. Considering its materials, how much more basic and direct can you get? Felt marker on paper is what you usually use for mailing labels or shopping lists. Here, however, we have an image that is arguably monolithic in its presence. It seems both ancient and contemporary. It is obsessive/compulsive in its mark making and yet zen garden like in its totality. The repetitive marks also create a textured surface that suggests way more physical substance than what you would expect to see from just a thin piece of paper. The next image is by English designer Emily Forgot (aka Emily Alston). 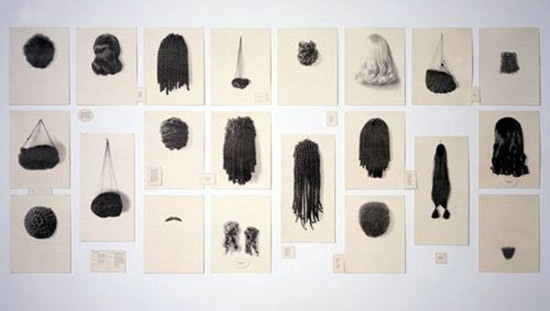 This is an installation view of her solo exhibition Neverland. The work in this show is inspired by Forgot’s interest in architectural space. 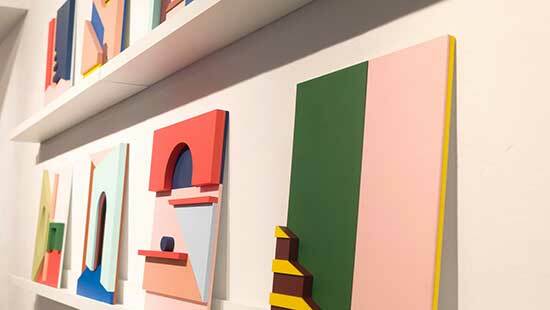 The small pieces seen here are simple constructions made from medium-density fibreboard that has been cut into eccentric geometric shapes, painted with flat pastel colors, and then stacked and glued. There is no mystery about the fabrication process and the colors/shapes are totally obvious. You don’t have to look at the individual constructions for very long, however, before you get caught up in their whimsical back-and-forth banter between real and illusory space. These are solid objects that exist in our three-dimensional world but yet they pretend to be no more than two-dimensional paintings or drawings dependent on illusion to suggest depth. The last example is by Dutch designer Monique Bröring. This small sculpture is from her series Office Plants. Here Bröring has collected found objects from a variety of worlds and combined them to create something new. 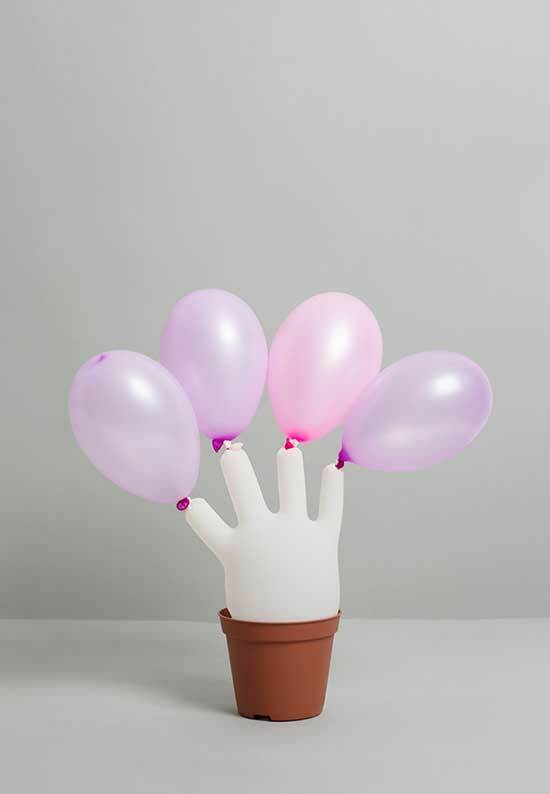 Party balloons, a doctor’s latex glove, and a plastic flower pot come together to suggest a humble workplace decoration. The message could easily be that office plants are little more than decorations and therefore an invented configuration is just as good. I prefer to simply enjoy contemplating the similarities of form between the organic ideal and the invented substitute. It’s the playful mind of an artist at work. 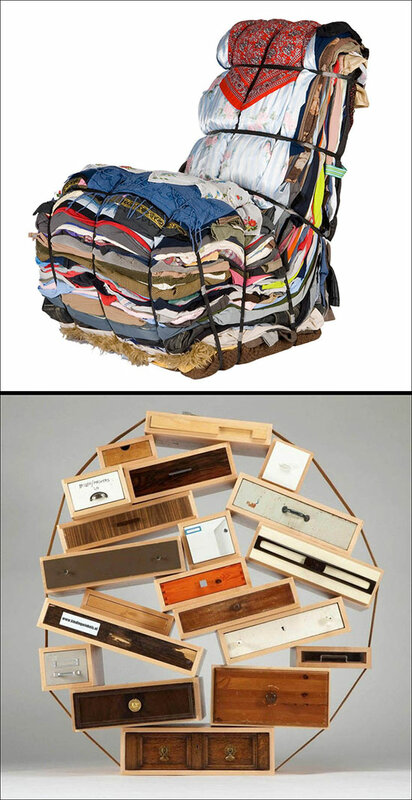 In each of these examples the artist has created elegant and thought provoking objects using simple materials. Their creative process has been stripped down to its essence, but that essence is really the core of what matters most. Two weeks ago I wrote about the use of repetition and its relationship to the design principles of Balance, Unity and Variety, the Grid, Pattern, and Rhythm. 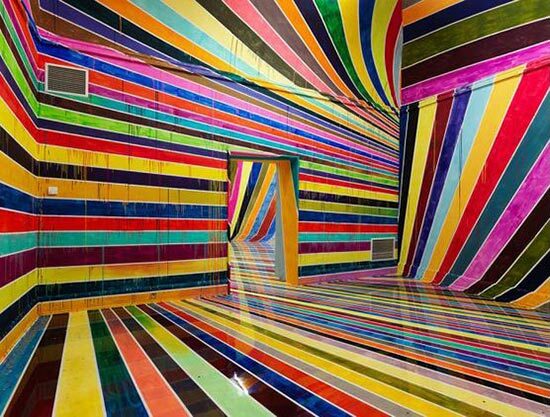 Today I want to present some more examples of works that utilize repetition. If you haven’t read my previous post here is a link to Repetition and the Principles of Design (Part One). Repetition is easy to spot. If you look at the examples from my prior post it shouldn’t take much effort to grasp its use. That’s also true of most of the art shown in this post. But, there are also more subtle ways to employ repetition. The first image below, painted in the 1660s by Diego Velázquez, is an example that I’d like to take a moment to discuss. 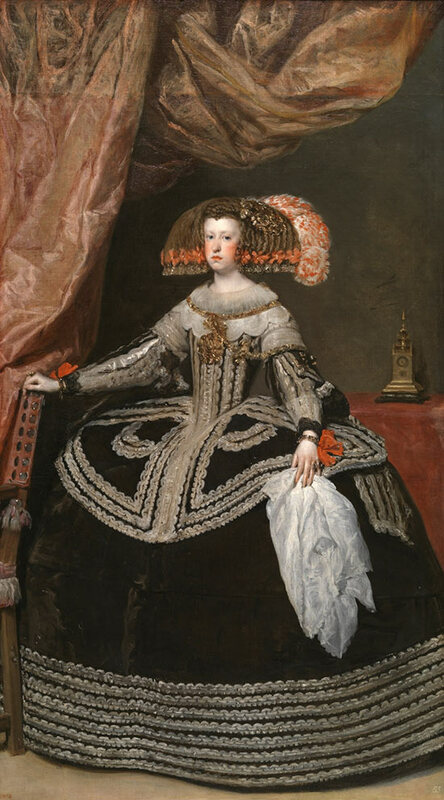 In this portrait of Queen Mariana of Austria Velázquez uses repetitions of color, line and shape to move the viewer’s eye through the picture. The focal point of the painting is the Queen’s face, which is emphasized by the strong red horizontal line of what appear to be flowers woven into her hair. We find this red color repeated throughout the painting. Our eyes move between the line of flowers and the two red forms at her wrists. As we look further we notice that she is framed in space with the color red – a table cloth in the background, and draperies above and beside her. 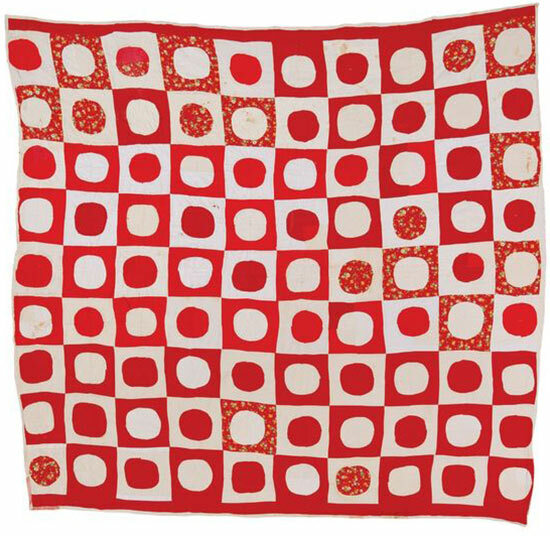 Taken together, the various shades of red unite and balance the composition. In addition, we can connect the strong reds at her wrists and her red lips (which are at the center of the red line of flowers) by drawing imaginary straight lines, creating a triangular shape. This shape is mirrored in the elaborate embroidery at the top of her skirt, forming base to base triangles. 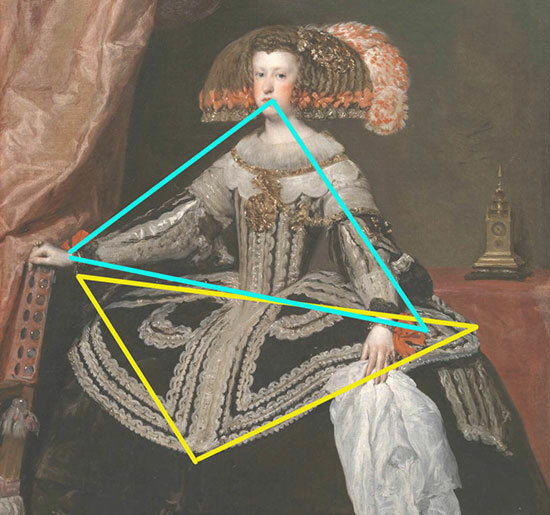 These two triangles are at the heart of the composition. Where else can we discover the use of repetition? If you look at the first image I’ve included you’ll see that Velázquez has used line as a repeating motif throughout the painting. The decorative lines of the embroidered dress are repeated in the line of flowers in Mariana’s hair. 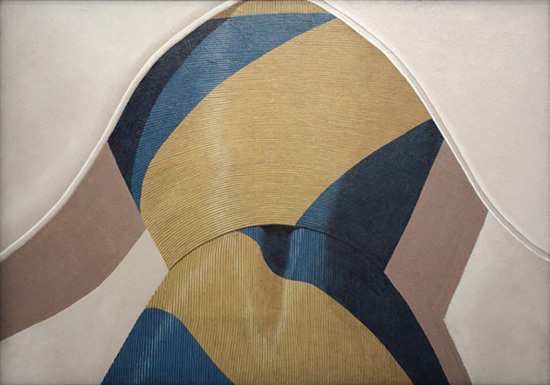 We end up circling through the composition, moving up and down between the horizontal lines in the hem of the dress and the strong red horizontal line in the central portion of the painting. Our eyes travel back down through the winding pathways in the bodice and upper skirt. All of this movement balances the otherwise static position of the figure, serving to enliven the composition. I did promise you some more obvious examples of the use of repetition and here they are. 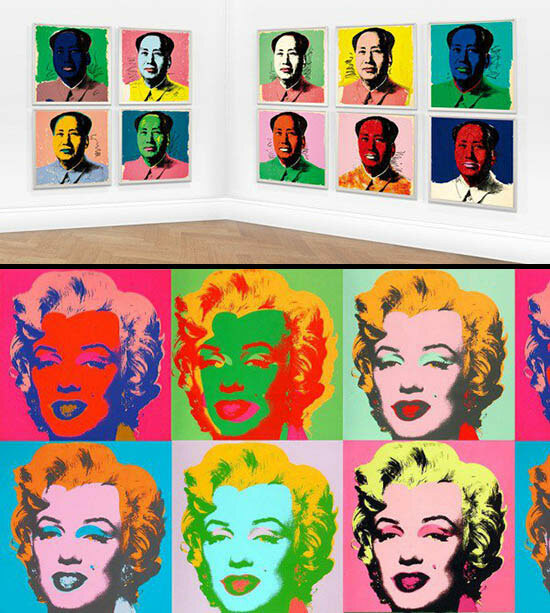 The term “hotel art” is generally used to describe bland imitations of serious artworks. It’s meant to dismiss, even ridicule, work that is primarily decorative and extremely easy on both our eyes and our minds – a corporate committee’s version of visual white noise. Spend the night in most hotels or motels around the world and you’ll hardly notice the paintings on the walls or the sculptures in the lobby. Most of what you’ll see has been selected because it blends in with the decor and is anything but challenging or engaging. The rooms and public spaces in generic hotels are designed to be anonymous. There are, however, a few hotels around the world that don’t follow this business model. These hotels cater to people who frequent galleries and museums. People who display original artwork in their own homes. People who choose to stay in a hotel filled with invigorating, even challenging, images and objects. 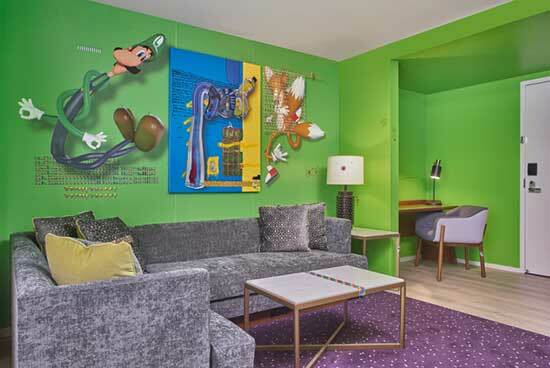 The 21c Museum Hotels is a chain of seven hotels located throughout the midwestern United States. The original hotel in Louisville, Kentucky was launched in 2006 by art collectors Laura Lee Brown and Steve Wilson. Like all the other locations in the chain, this first hotel is housed in a repurposed historical structure (here it’s a 19th century tobacco and bourbon warehouse). The image above is a guest room in the Nashville, Tennessee hotel. 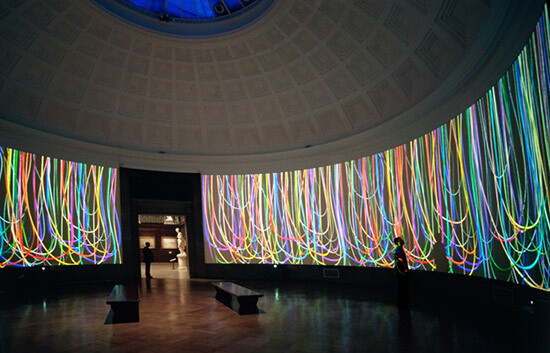 The room is designed by L.A. based media artist Yung Jake. 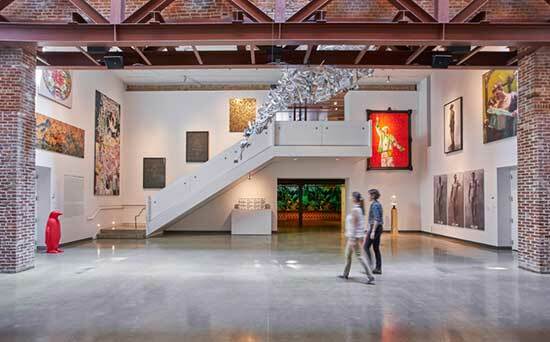 Other artists who have been featured at different 21c Museum Hotels throughout the chain include internationally known artists such as Bill Viola, Andres Serrano, Kara Walker, and Alfredo Jaar. The Dolder Grand in Zurich is a recently remodeled historic hotel dating from the late 19th century. Mixed in among the elegant architectural features of the building visitors will find over 120 mid-20th century to contemporary era works of art by world famous artists. 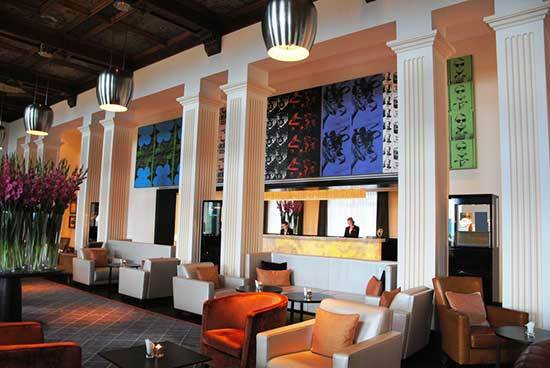 Above the front desk, for example, is the 36 foot (11 meters) long Big Retrospective Painting by Andy Warhol. 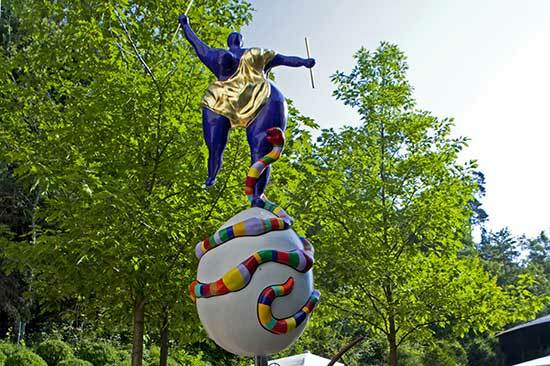 The image above is a sculpture by Niki de Saint Phalle located in one of the hotel’s courtyards. Other artists on display throughout the hotel include Fernando Botero, Sol LeWitt, Joan Miro, Henry Moore, and Damian Hirst. Visitors can request the loan of an art iPad at the front desk that contains information and location for each of the artworks in the hotel. The Henry Jones Art Hotel in Tasmania, Australia is located in a repurposed early 19th century jam factory on the waterfront in Hobart. The architects who rehabbed the building saved much of its original character including the stone/brick walls and heavy wooden beams. The building has so much visual presence that the hotel’s 400 pieces of art merely add another layer of character to the guest rooms and lounge areas. 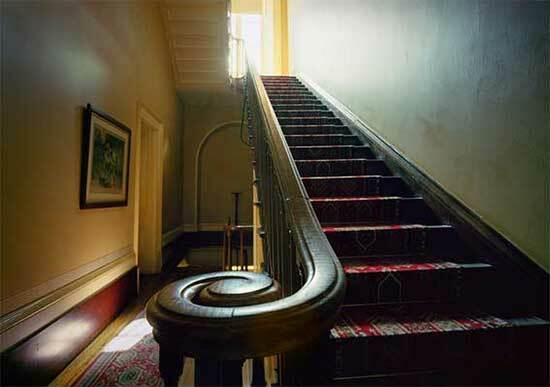 The art collection at the Henry Jones is focused exclusively on contemporary work by Tasmanian artists. The image above is a photograph of the Clarendon House by Ruth Frost. The next time you travel check ahead and see if there is an art hotel (or a hotel noted for its collection) at your destination. Coming back at night to an interesting and thought provoking space will add greatly to your tourist experience. Last week when we celebrated spring by playing hooky I encouraged you to download a copy of our book, “Design: A Beginner’s Handbook.” That got me thinking about the relationship between our blog and our book. When we wrote our design book we decided to focus on the elements and principles of design as found in the everyday world. Our interest was in training you to see and think visually – finding and understanding elements such as line and shape in your daily encounters. We developed the blog as a supplement to the information covered in the book. The blog is the place where you will find the elements and principles of design put to use by artists and designers. We often discuss sophisticated works of art without specifically signifying their relationship to these fundamentals of design. Our hope is that by reading the book you’ve created a filter through which you process the information covered in the blog. Today we’re going to return to several of those core design ideas, looking at repetition as its found in the organizing principles of Unity and Variety (Chapter 8), Balance (Chapter 9), the Grid (Chapter 10), Pattern (Chapter 13), and Rhythm (Chapter 14). 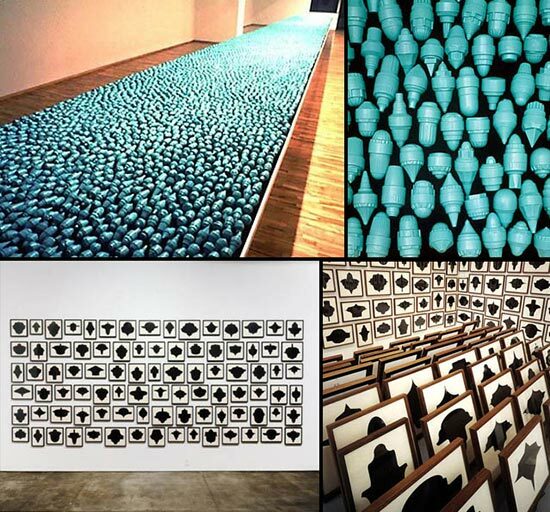 What are some of the ways artists and designers use repetition? One device used by artists and designers working with both two-dimensional and three-dimensional media is the “multiple” or “serial” format. 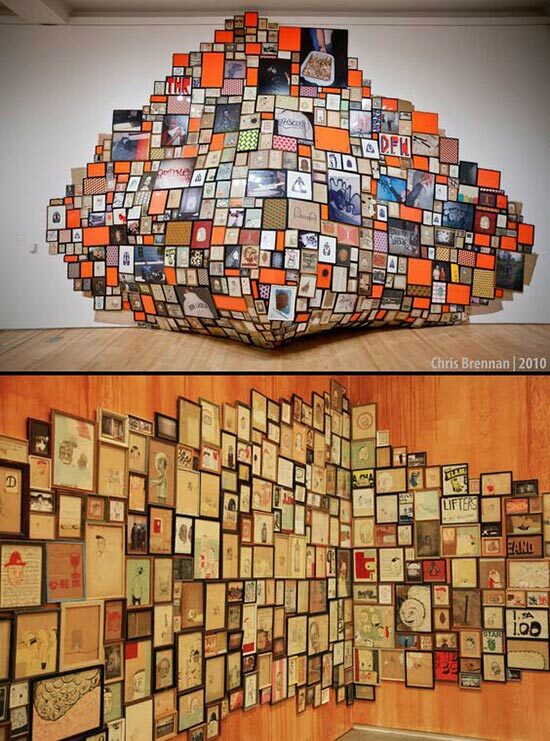 In these instances the artist makes several versions of the same piece, often with variations from one to the next. They are designed to be viewed together. (Note that the term “multiples” is also used to refer to editions, such as prints, but these are not meant to be seen as a single piece and they are not what we are discussing here.) Andy Warhol often worked in this manner. Another device, found in many sculptural works, is the repetition of a single material or component. 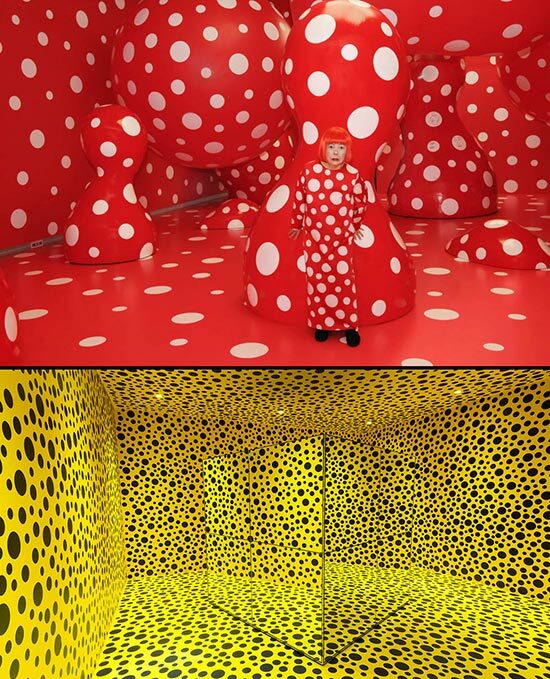 Examples can be found in the work of artists such as Tara Donovan and Félix González-Torres. 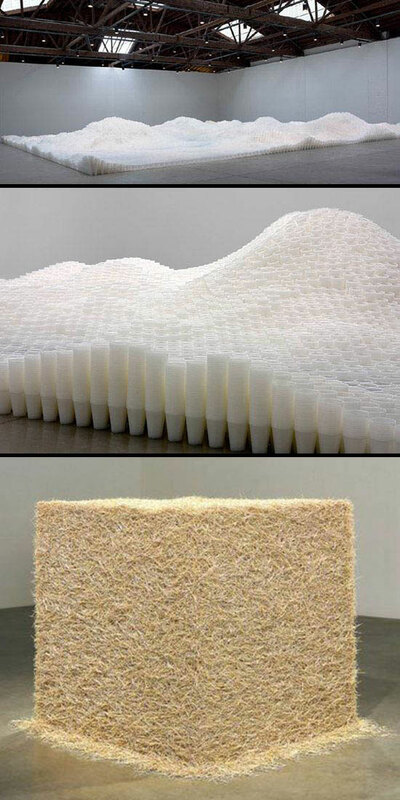 Tara Donovan has worked with large volumes of toothpicks to create a cube, and huge numbers of styrofoam cups to make undulating cloud-like installations. 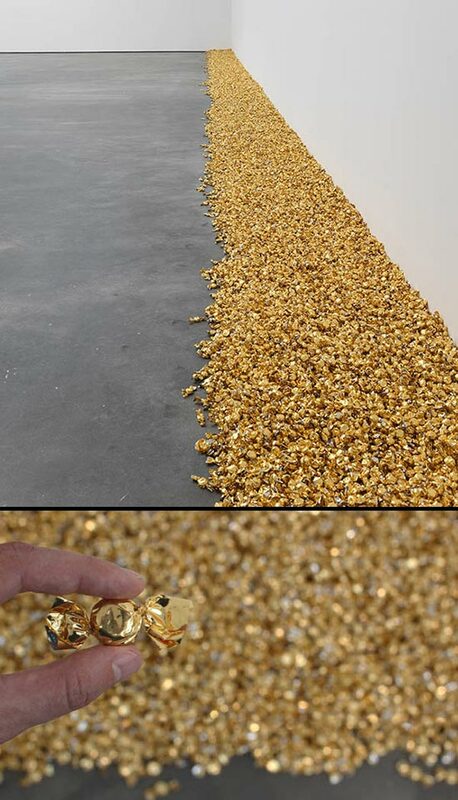 Among other things, Félix González-Torres is known for his installations comprised of thousands of hard candies. 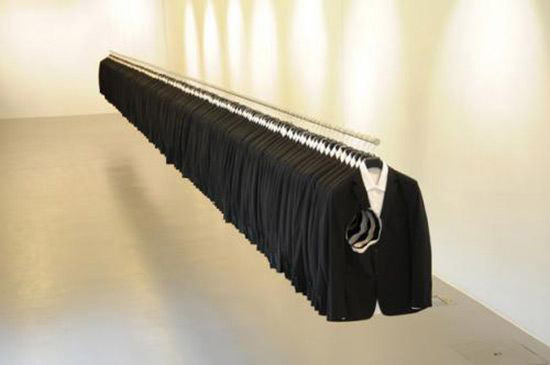 In other instances artists employ repeating elements within a single composition. The viewer’s eye will naturally move from one repeating element to another, unifying what otherwise would be a chaotic composition. Let’s not forget the use of repetition to make patterns. In fact, repetition is how patterns are made. 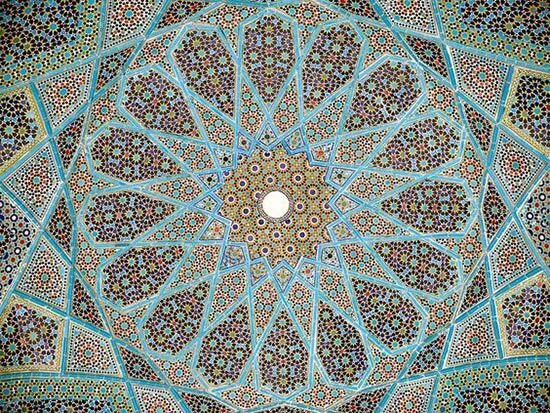 It is the basis of many quilts, of patterns found in architecture, and of the complex designs central to Islamic works of art. Now, reread the chapters that I listed above. As you do so think about the idea of repetition. What role does repetition play in establishing unity and variety? How is it used to create balance? Does this change how you view the grid? Can you even separate the idea of repetition from pattern and rhythm? 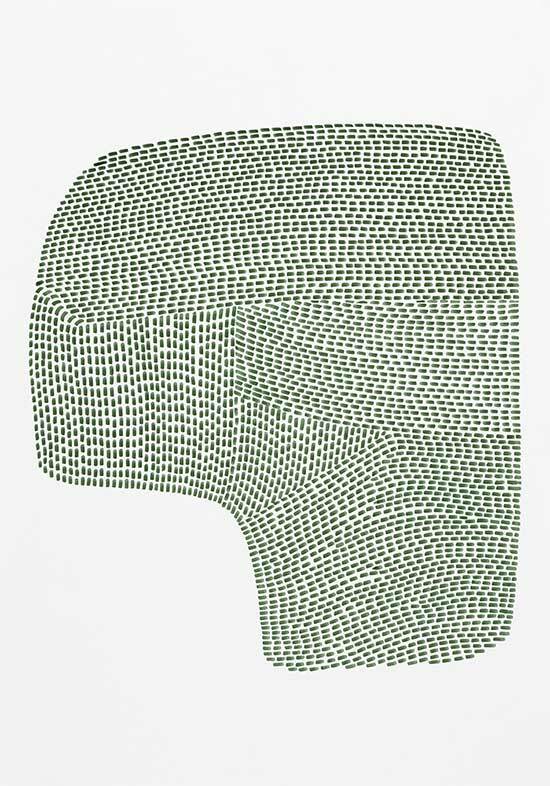 Scroll through the images below and think about how and why the artist has used repetition. Does it help balance the work? Does it create a pattern or a sense of rhythm? Does it demonstrate the use of unity with variety? Does it increase the power of the individual unit or does it diminish it? 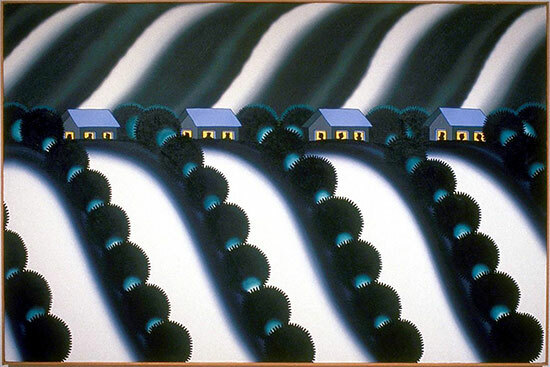 When I began to put together the images for this post I was reminded about how prevalent the use of repetition is in the fields of art and design. I could easily have included thousands of works.